It’s not uncommon to have water in the basement after a hard rain. But if you regularly have a flooded basement after storms, you may have to rethink the landscaping around your home. 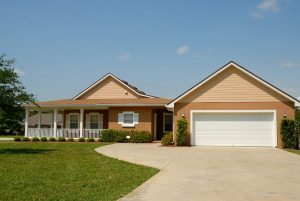 Water can enter your home several different ways when there are problems with your landscaping, and all of them can cause significant damage if left unchecked. Porous materials like textiles, wood, drywall, and insulation soak up water and help it spread through the building. Even worse, mold growth begins in as little as 48 hours after excess moisture enters a building because the spores are everywhere in the air. They only need moisture and a source of food to grow, and homes are full of food sources like paper and clothing. 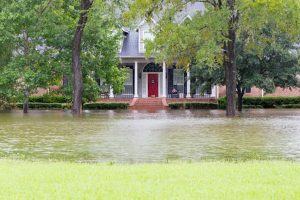 Follow these flood prevention tips to make sure your landscaping isn’t diverting water into your home and learn how to fix problems quickly and inexpensively. Check the downspouts. Make sure they direct water far away from your building. They should send water at least 20 feet away so if they don’t, consider buying new ones or extensions for yours before the next storm. The connections between gutters and downspouts can become loosened over time, so check to see if they’re still firmly attached. Clogged gutter systems can’t direct water properly, so clean yours at least once a season to remove leaves, seedlings, small branches, and other debris. Installing gutter guards on top of gutters will reduce both clogs and the number of cleanings. They will only need to be checked occasionally to make sure the guards haven’t broken or become clogged. Look at the grading of your landscape. Do your flower beds run downhill towards your home? If your answer is yes, you probably have the reason for your wet basement. When your grading runs towards your home, it guides water in just like a funnel. The only way to stop the flooding is to improve the grading. Use gravel and river rocks of different sizes to raise the grade of the area and guide water away from the basement. Mulch the right way. Mulch is more than just a decorative groundcover; it can hold moisture in and help your plants thrive. While that’s great for your bushes, if that damp mulch is right next to your home, it can rot the building materials over time, allowing rain inside and leading to water damage. If you use mulch around your home’s foundation, leave at least six inches between the mulch and the building to allow for drainage and air circulation. Reconsider which type of mulch you use next to your home; river rocks won’t hold as much moisture as wood chips or bark. Use native plants for landscaping. Plants, grasses, and shrubs that are local to your area will grow well and naturally prevent flooding by soaking up moisture before it can get into your home. Since they have already adapted to the climate and soil, there’s no need for excess watering to keep them looking their best. If you’re not sure which plants will work in your area, Google the name of your county, then “Master Gardeners” to find your local state extension office’s Master Gardener program. These trained volunteers can answer all kinds of gardening questions for free. A few hours of landscape work on a weekend afternoon is all it takes to keep your basement free of flooding for years to come. The bonus is that this waterproofing project will make your home look prettier too. Any time you need high quality water damage restoration services in Northbrook, Wilmette, Glenview, Highland Park, Lake Forest, Winnetka, Buffalo Grove, IL or surrounding areas, the only name you need to know is ServiceMaster DAK. We’re available 24 hours a day, 7 days a week to respond to any type of water damage emergency. Our IICRC certified technicians know that time is crucial when it comes to preventing mold growth and water damage to property and structural elements, so we use only the most effective drying and water extraction equipment available to the industry. With over 40 years of experience, there’s no job too big or too small for us to handle, and we work with most insurance companies to resolve claims as quickly as possible. Water damage restoration costs vary, depending on the amount of water in the building, the number of items needing restoration, and the presence of mold.